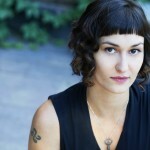 Originally from Vancouver, Andrea Nann is now a Toronto based contemporary dance artist, artistic director of Dreamwalker Dance Company and creator of The Whole Shebang and The Ontario Shebang. Andrea choreographs and creates works for the stage, film, and various outdoor sites. She was a visiting artist at River Run Centre (Guelph), Burlington Centre for the Arts, and Brock Centre for the Arts (St. Catharines), and was a Resident Artist of Soulpepper Theatre Company (2009-2014), and Canadian Contemporary Dance Theatre (2008-2009), and Iris Garland Visiting Choreographer at Simon Fraser University (2012).